That’s the partial reading list for the first quarter.The Malayalam book is Marthandavarma, written in 1891 by C V Raman Pillai and the little green book at the top is The Travels of Sir John Mandeville & The Journal of Friar Odoric. Sometime after 1321, Friar Odoric, an Italian, spent time in Malabar, Cranganore, Kollam, and Chennai. For 2009, this blog has a new WordPress theme. varnam is now on twitter as well. I envy you….How do you get the time?! Warm wishes for a very happy, healthy, prosperous and peaceful 2009 to you and your loved ones. Thanks Shantanu. The secret is to sleep less. Please right a review of “A Critical Survey of Indian Philosophies” when you have the time. Would be interested in reading a good history of this. That book cannot be reviewed or I am not at a level to critique it. 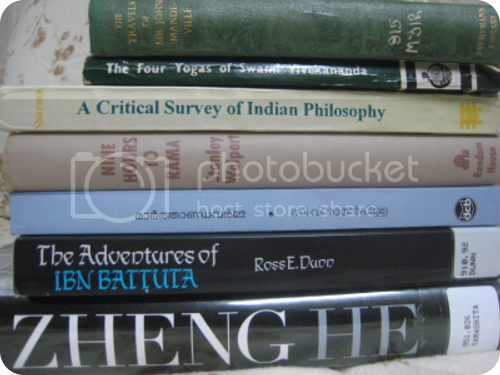 I use it as a reference for understanding all the schools of Indian Philosophy. Can I hope to see reviews of all those books on your blog? froginthewell, I may not write reviews of all of them, but they will be referred to in future posts. This proves it: you have turned to the dark side and become an academic, and, I mean this in the nicest way, an egghead. The books you have chosen do no look like easy reads. Philosophy, especially, is difficult. I, too, am looking forward to your thoughts on the book “A Critical Survey of Indian philosphy”. The Critical Survey on Indian Philosophy is very hard to read linearly. I use it as a reference to look up concepts when I encounter them. Will attempt a review sometime this year.